This 51T Blackout flash hider works in conjunction with AAC's improved ratchet mount sound suppressors. The 51-T mount is an intuitive, lightning fast silencer attachment/detachment system that allows for secure installation of a suppressor in less than 3 seconds with no tools or moving parts. Not compatible with the older spring mount (18-Tooth) or newer ratchet taper mount (90-Tooth) sound suppressors. 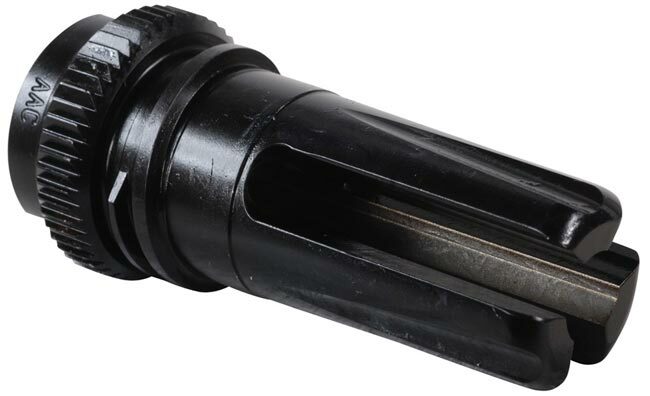 NOTE: This Flash Hider has a 30 Caliber opening and was originally envisioned for use on a custom threaded AK-47 since most factory threaded AK barrels lack concentric muzzle threads, and may therefore be unsafe for use with a sound suppressor.